TED is a highly precise weeding tool for vineyards. Its main asset is that it frees the hands and minds of wine growers so that they can spend more time on tasks with a higher value-add. TED is also an excellent alternative to chemical weedkillers, which are generally part of traditional wine growing practices. In addition, the robot’s weight has been kept to a minimum (900 kg) to avoid compacting the soil. When used frequently, it allows to regularly maintain the vineyard. 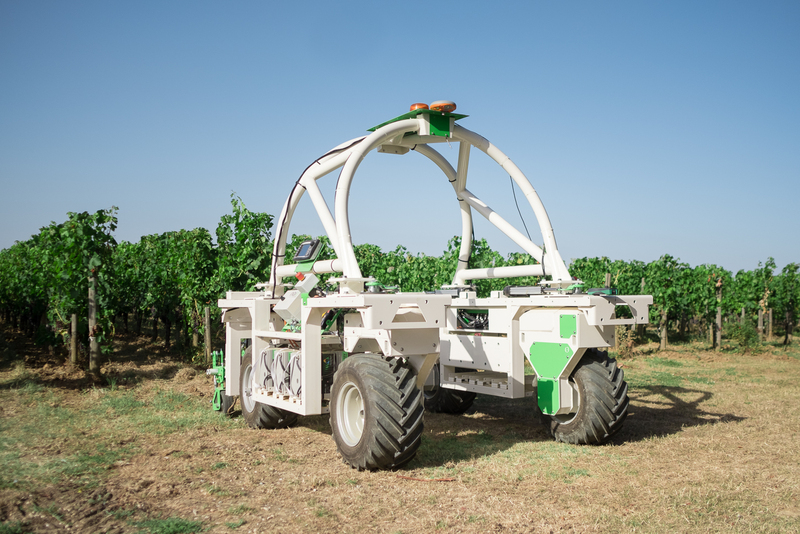 TED is the first entirely autonomous electric robot on the market to efficiently maintain and weed vine rows with a high level of precision. Naïo Technologies started marketing TED in 2017. Today, some 15 TED robots are maintaining the vineyards of our customers and partners. The Naïo Technologies team is convinced that vineyard robotics are THE solution to improve working conditions and profitability in the wine sector. In the current context of increasingly strict weedkill regulations, where a lot of herbicides become prohibited, and growing shortage in manual labor, automated mechanical weeding provides a new answer to help wine growers tackle these challenges. The TED robot provides high precision weed control while helping you save time throughout the season. TED takes care of weeding your vine rows, all by itself. It lowers the strenuousness and strain of weeding to optimize working conditions. TED helps you lower variable costs. The robot is entirely electric, which greatly reduces energy and maintenance costs. The fact that it weeds mechanically allows you to save on the purchase of chemical weedkill products. The TED robot weeds your wine crops all by itself without any assistance. It frees your hands and those of your team as well your mind so that you can concentrate your energy on more value-add tasks for your wine farm. TED is an environmentally-friendly robot that works the soil mechanically thanks to a range of specialized tools. As it is 100% electric, it allows to reduce the use of herbicides while limiting the emission of greenhouse gas and particles. TED allows you to schedule weeding interventions when they suit you best. The robot is entirely autonomous and allows you to program a weeding session for a different plot while it’s already weeding another plot. TED also helps you intervene longer when climate is subject to changes and can return to work sooner after a rainy episode. Thanks to its electric design, TED helps you reduce the time you spend on maintaining your viticultural equipment. TED is an autonomous weeding system. It works all by itself, at centimeter precision and without any assistance, thanks to its GPS RTK guidance system. Plots are mapped out automatically with the help of a photographic drone. The plot’s data are registered using a drone. To work autonomously on every vineyard plot. Origine: designed and manufactured inFrance. * Under ideal conditions, may vary depending on actual conditions of use. Soil work tools for inter-row and interplant work: Kress rotors, passive interplant blades and non-reversible ploughs. Prototypes of other tools are also available for mowing, debudding, trimming, spraying, etc.